Emperor Chris Baywood Ibe, founder of Africa’s leading charity foundation, Baywood Foundation has called for the adaptation of the ‘Affirmative Action’ for African youths with a view to empowering and giving opportunities to youths to participate in politics. 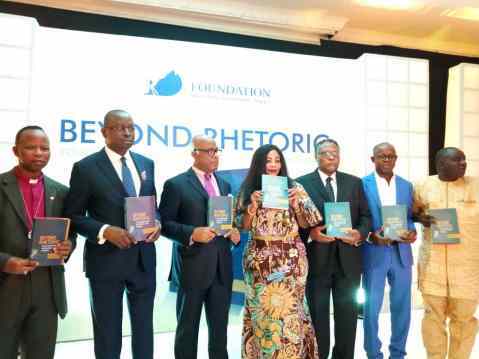 Emperor Ibe made the call during the launch of a book published by the Baywood Foundation, ‘Beyond Rhetoric’. Ibe who mentioned that opportunities should be given to youths to take leadership positions added that except youths are given opportunities to take responsibilities and tasks, they cannot be accused to have failed their generation. Emperor Ibe who described Nigeria as a talking nation yet no action explained that the title of the book, ‘Beyond Rhetoric’ is meant to proffer solutions to the challenges faced by youth instead of just talking and not doing anything. The founder of Baywood foundation explained that the book which is Youth Empowerment and Political Voice in Nigeria is part of his contribution to the development of youths. On a contrary view, the Chairman of the occasion, Emmanuel Ijewere believed the youths need to grab power and should not expect affirmative action or that power would be handed over to them willingly. On his part, the keynote speaker, a development expert and global justice activist, Dr Hussaini Abdu believes there is a meeting point between affirmative action and direct action. He applauded the Not Too Young To Run Act which gives an opportunity for youths to be involved in politics but stressed that more needed to be done. He added that the private sector and civil society organizations have a role to play in advancing the course of the youths but noted that the government must play its part so that interventions from other parties can be recognized. The book ‘Beyond Rhetoric’ was officially launched after the review was done by Prof Patricia Duli from the University of Maiduguri.